Nordstrom in Vancouver BC under construction on January 6, 2014. Photo by Sue Frause. Canadian shoppers in British Columbia are keen on crossing the border and heading to Nordstrom in Washington state. But by the spring of 2015, they won't need to pack their passports to make a pilgrimage to the Seattle-based department store. That's when Nordstrom is scheduled to open in downtown Vancouver in the space vacated by Sears at Pacific Centre (formerly Eaton's). 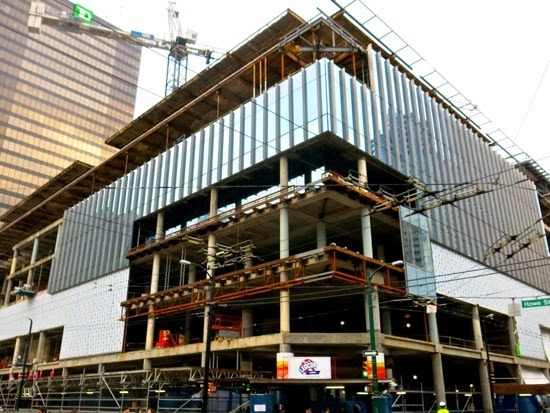 The Vancouver Nordstrom will be the largest of the Nordstrom stores in North America. It's located on Howe Street, across from the Vancouver Art Gallery, between Robson and Georgia. I passed by there today and took the above photo. Fall 2014 | Chinook Centre, Calgary | Two levels, approximately 140,000 sq. ft.
Spring 2015 | Rideau Centre, Ottawa | Two levels, approximately 157,000 sq. ft. and Pacific Centre, Vancouver | Three levels, approximately 230,000 sq. ft.
Fall 2016 | Sherway Gardens Toronto | Two levels, approximately 138,000 sq. ft.
Nordstrom is partnering with Cadillac Fairview, one of North America's largest investors, owners and managers of commercial real estate, to lease the four stores at the shopping centres. Here's more information on the Vancouver project from Huffpost British Columbia (including artist's renderings).